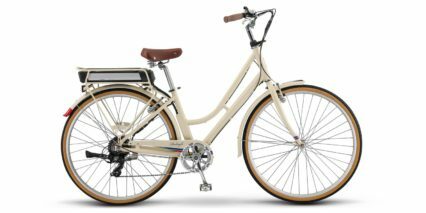 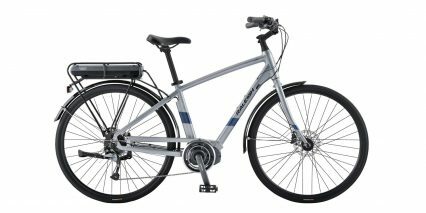 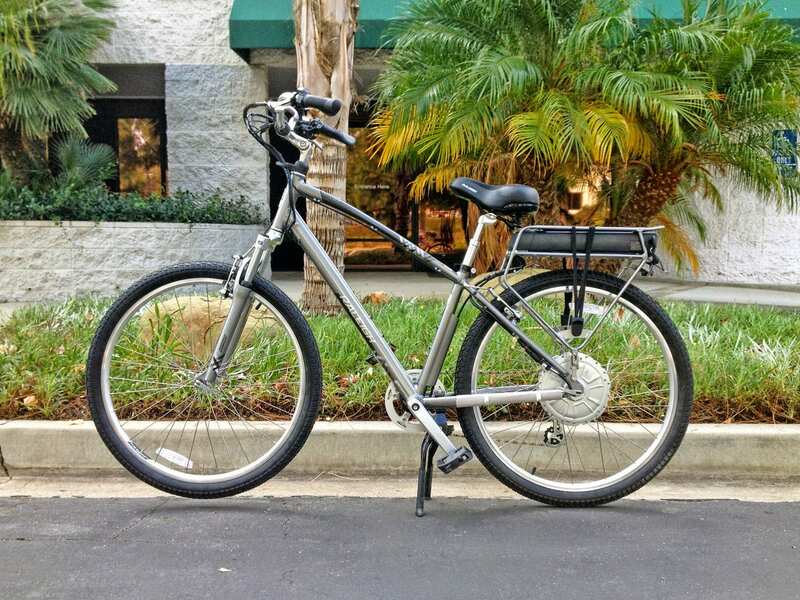 Kenda K841A, 27.5" x 1.95"
The Venture iE is a comfort hybrid from Raleigh that offers a powerful (but quiet) motor system designed by Currie Technologies, produced by TranzX. 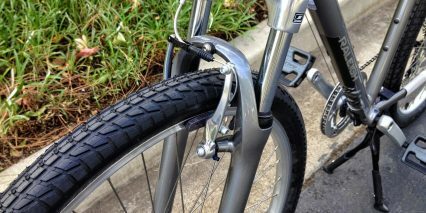 What you get here is a proven frame that comes in either high-step or step-thru configuration as well as multiple sizes for a perfect fit. 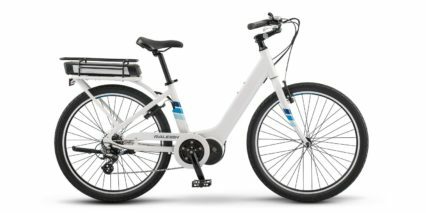 This is probably my favorite ebike in Raleigh’s lineup for the late 2014/2015 season because the suspension fork, suspension seat post and fatter tires really smooth out the ride. 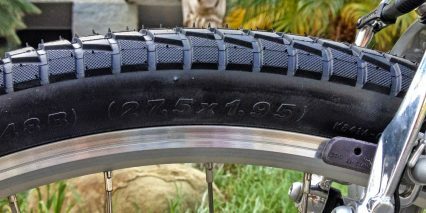 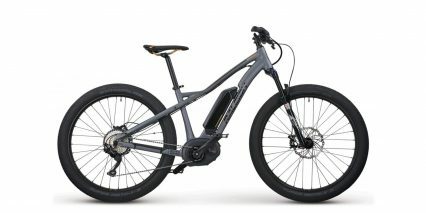 the wheels themselves are 650B or 27.5″ which is slightly smaller than a road bike but larger than a traditional mountain bike. 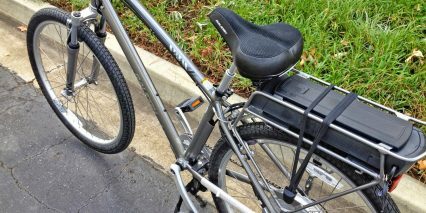 That makes them efficient but slightly more maneuverable and comfortable. 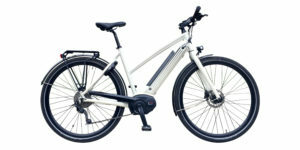 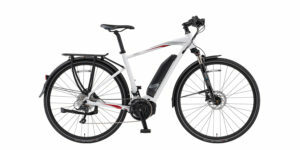 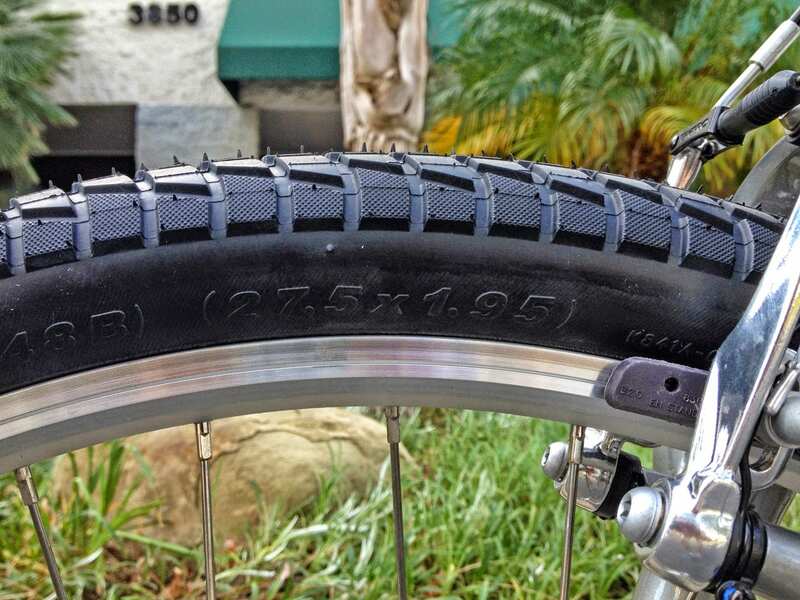 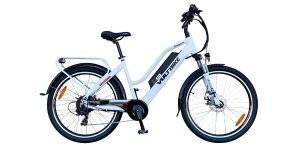 Both the front and rear wheel offer quick release (and the motor has an easy disconnect point) which makes the bike easier to service or change flats on. 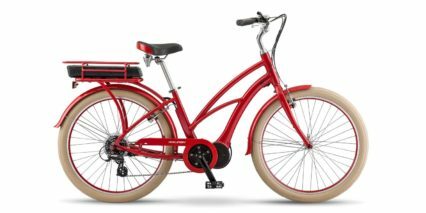 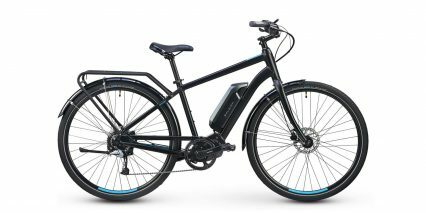 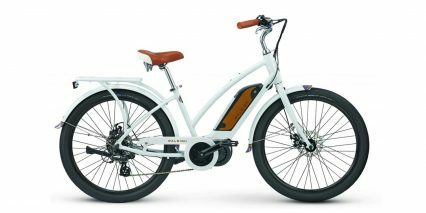 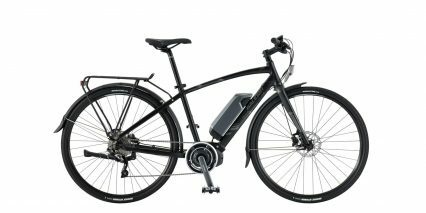 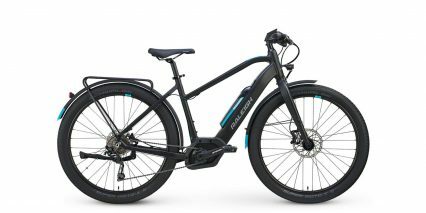 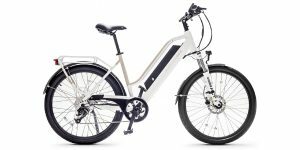 While this electric bike doesn’t project a lot of excitement with flashy colors, disc brakes or integrated batteries and higher top speeds… that’s actually one of its strengths in my opinion. 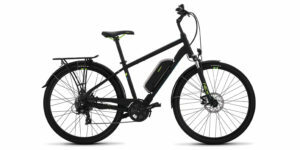 It blends in, it’s well priced, the motor is super quiet and it operates a lot like a regular bicycle only it helps you go further and climb hills more easily. 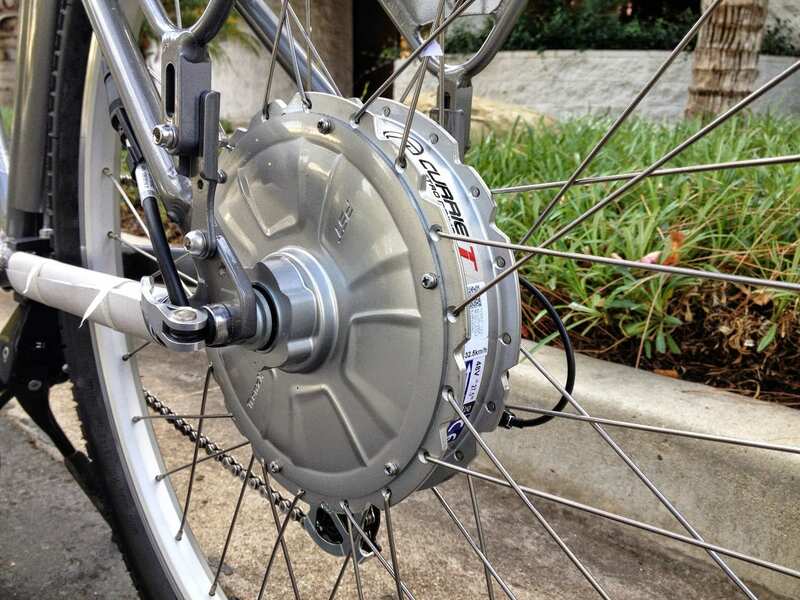 The motor driving this ebike is a gearless direct drive 500 watt hub located in the rear. 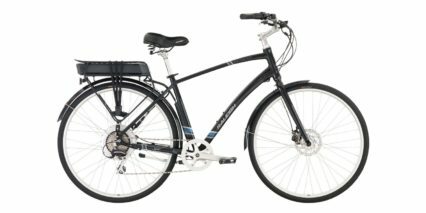 It’s heavier than some geared equivalents but runs smoother, quieter and will last longer. 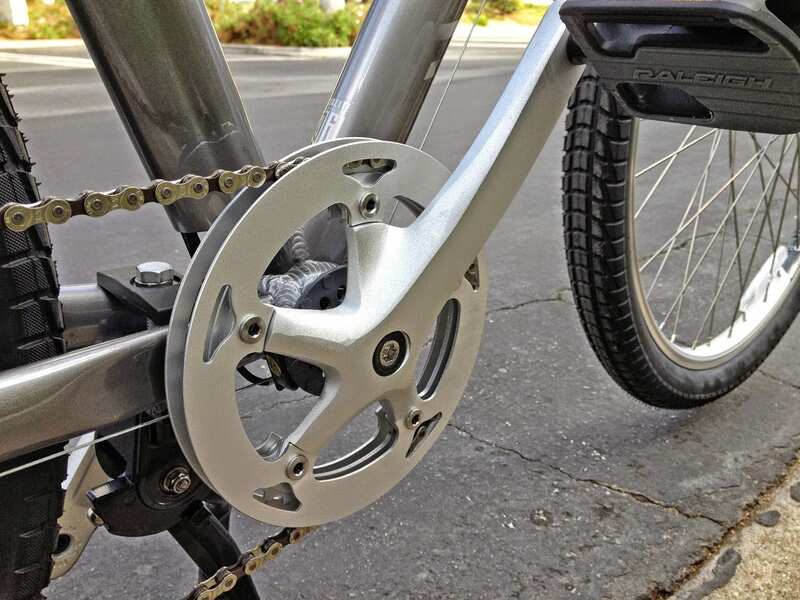 This is actually one of my favorite electric bike motors from Currie Technologies because it rides so smooth but still feels zippy. 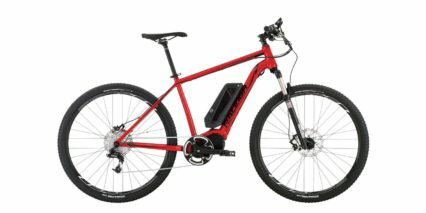 One downside is that there is some cogging (drag from the larger magnets inside when the motor is off) but it’s not a deal killer. 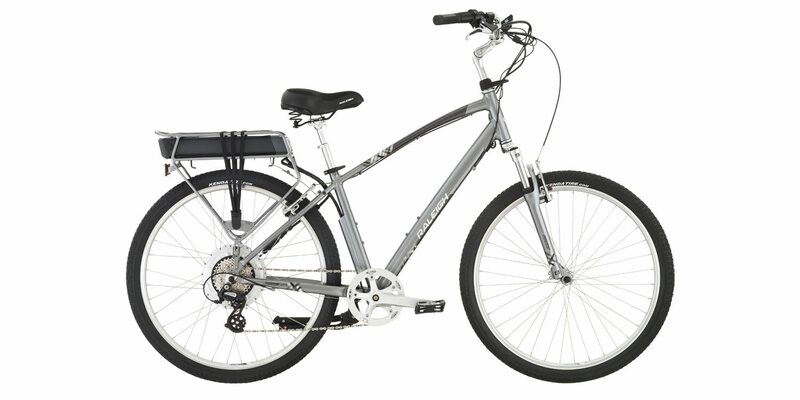 The silver color really blends in and the metal casing protects from dust and water when riding. 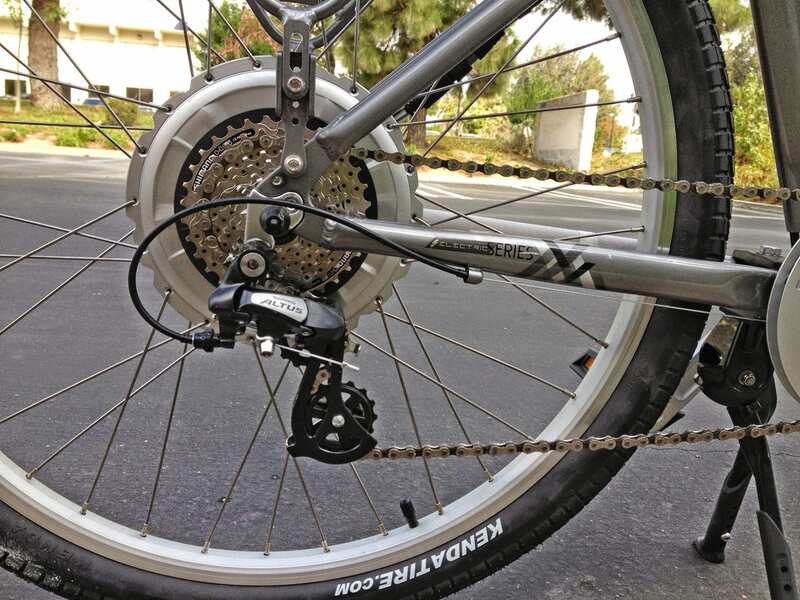 The great thing about a hub motor is that it adds a sense of power no matter which gear you’re pedaling with. 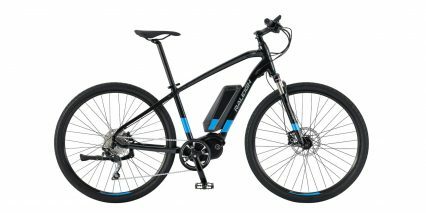 I was impressed with how much get up and go it has in both throttle and pedal assist mode (which have a top speed limit of 20 mph to comply with US regulation) as you can see in the video review above. 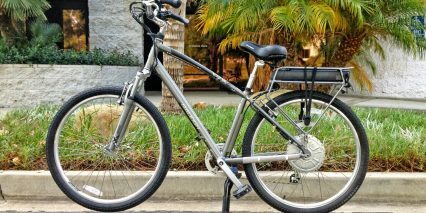 Powering the Venture-iE is an impressive 48 volt 8.8 amp hour Lithium battery pack with high quality Lithium-ion cells. 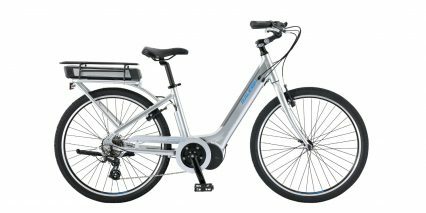 The 48 volt configuration provides more electrical efficiency, power and torque which lets you take advantage of the 500 watt motor. 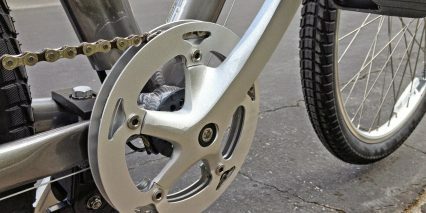 What might otherwise feel mushy (when using the throttle) feels zippy even though the motor isn’t geared. 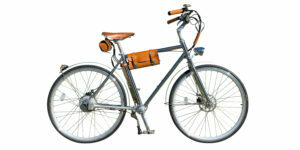 The pack is removable for convenient charging and reducing the overall weight of the bike during transport. 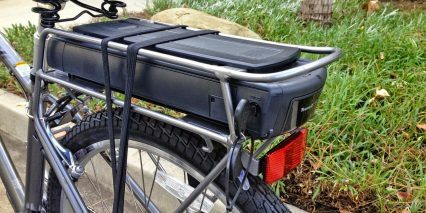 The rack is built in such a way that it completely surrounds the battery pack which adds some protection if the bike tips. 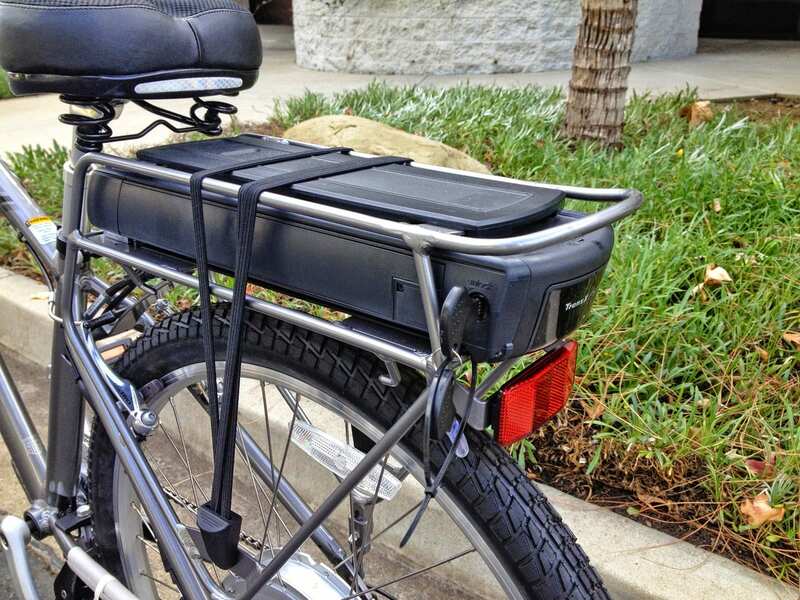 The tubing on the rack is standard sized which makes adding bags or panniers seamless and it comes stock with a triple-bungee cord for securing basic items. 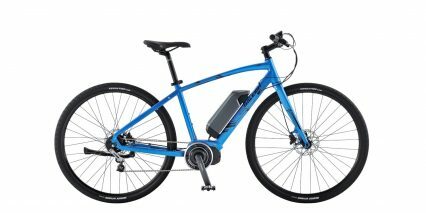 I like that the battery also has a handle built in and that the handle has magnetic clasps that keep it stowed when riding. 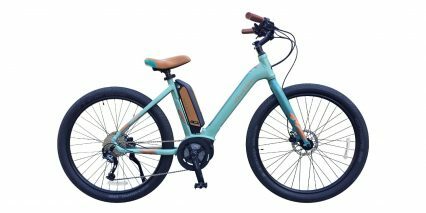 Also, unlike some older ebike batteries, this one does not require that you leave your keys in when riding and that’s great because they won’t be jingling around or be exposed to contact and snags. 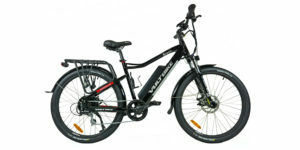 Operating the ebike systems on this bike is very easy and intuitive. 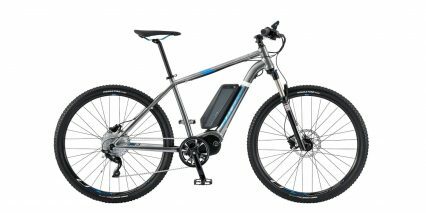 Once the battery has been charged up and is secured and locked in the back slot, just press the power button on the control pad and the screen comes to life. 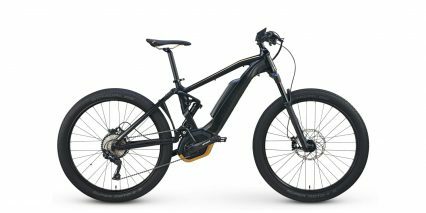 The display is backlit with an auto-light sensor for easy use at night and shows your speed, battery level and assist level as well as range. 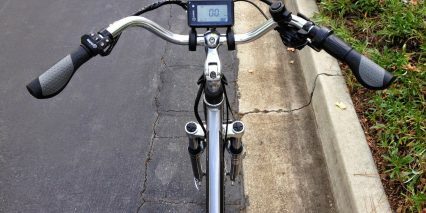 To maximize your distance, I suggest using pedal assist but it’s also nice to have instant power from the throttle mode. 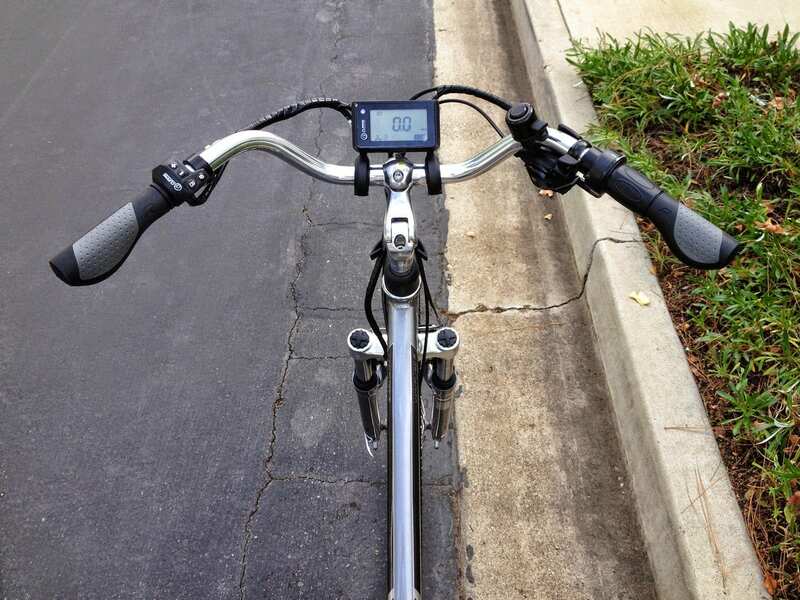 You can also use the throttle in conjunction with pedaling at any time to add a bit more power in the lower levels of assist but for this to work you have to be pedaling. 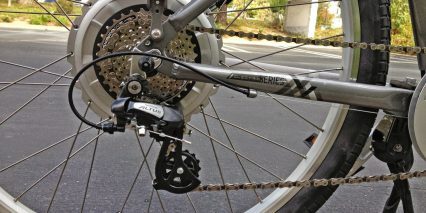 In terms of pedal power, you get an eight speed cassette in the rear and a trigger shifter interface on the right bar. 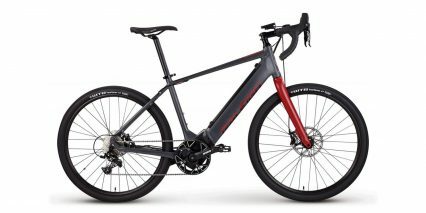 The derailleur and sprockets are mid-level in terms of quality and in my opinion eight speeds is enough to get around town and climb hills without adding the complexity of a second front derailleur. 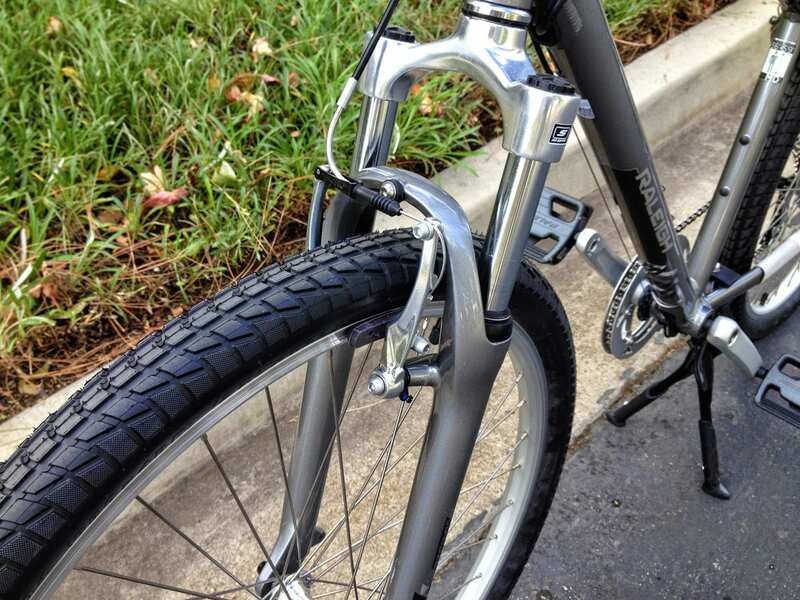 I really like the front chain guide they’ve used here which doubles as a bash guard in case you hit a curb but you don’t get fenders or a chain guide on this bike. Lights would also be nice but definitely add to the price. 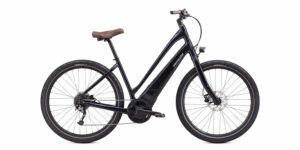 The Venture-iE appeals to me for its comfort, quiet operation, power and availability. 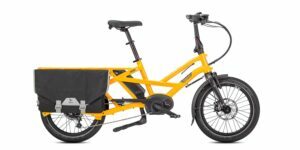 In the past it was much harder to find and test ride an ebike (and get a frame size that would fit right). 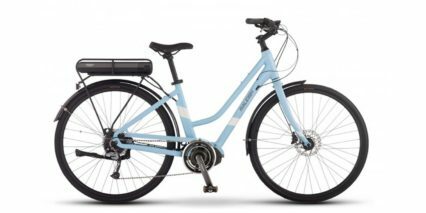 Raleigh has lots of distribution outlets and is actually one of the oldest bicycle companies in the world, having been founded in Nottingham UK in 1885. 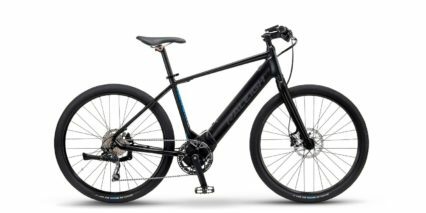 Their deep knowledge of frames, wheels and other components combined with economies of scale for manufacturing keeps this bike at a relatively good price. 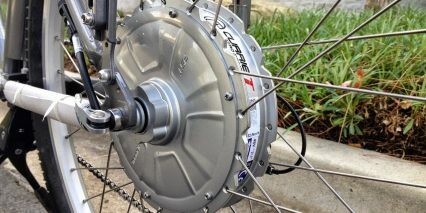 The drive system also comes from a leading company, Currie Technologies, that has been producing ebikes and scooters in the US since 1997 and this drive system is actually a second generation build so there shouldn’t be any kinks or bugs in the system. 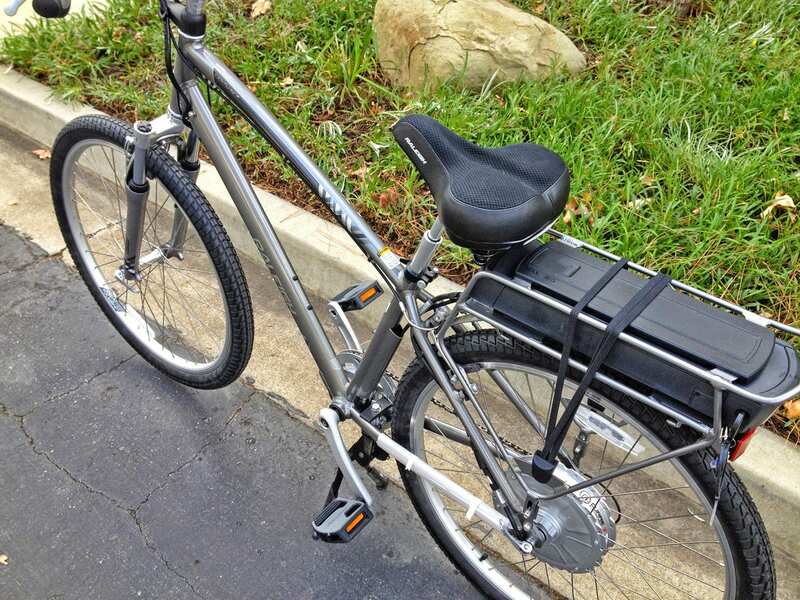 While I would have liked to see fenders and lights, it’s nice that those can still be added aftermarket and while this is a rear-heavy frame design it’s much less of an issue for just cruising around on roads and I really like the rack setup. 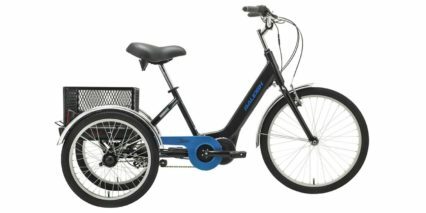 For commuting or just cruising around town this could be an excellent choice.